Joon is the new generation travel experience by Air France! Joon is an airline that breaks with convention, goes beyond the airport gates and is inspired by the new expectations of travellers to offer a total travel experience. At Joon, the catering offer includes organic dishes, the entertainment is in tune with the times and it will even take care of your car while you’re away! Joon is an identity created by Air France together with the expertise of brand design agencyBrandimage and a 100% digital advertising campaign designed by BETC. Joon, is a simple and optimistic name. Joon is above all a colour, the electric blue (pantone2736C) that we’ll see wherever our customers may be, from the aircraft livery to the seats and on Joon’s staff uniforms. With its chic sportswear look, Joon’s flight attendants’ uniform is inspired by its customers and reflects the spirit of the company. The uniform is made up of classic and modern garments, with slimline trousers, sneakers, redesigned sailor stripes and a sleeveless quilted jacket. Impossible to mistake it for another airline, Joon is unique! For an airline unlike any other, it needed an original and unique advertising campaign. This was the challenge for BETC. Joon is a fashion brand, a rooftop bar, a personal assistant, a TV channel on demand, and oh ... Joon does flying too! 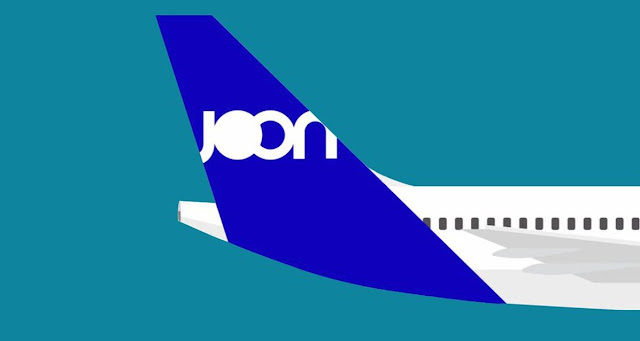 “Joon, also an airline” is embodied in a100% digital communication campaign: #weflyjoon. A social media side will be gradually unveiled throughout the year, launched with ambassadors-influencers who embody the spirit of the brand at each of its five European destinations (Barcelona, Berlin, Lisbon, Paris and Porto). Each one will unveil its best tips to discover the city off the beaten track. The campaign will then take over to further enhance the travel experience and ensure Joon’s position as a total travel partner. “We wanted to create a direct, friendly and authentic brand. The choice of this electric blue immediately illustrates this strong identity. All these elements, this innovative spirit, are portrayed in a film that introduces Joon’s brand territory. It depicts two flights attendants representing the fun spirit of the ‘Joon, also an airline’ experience. The soundtrack is by electro pop group Blanche Palace” explains Caroline Fontaine, Global Brand VP at Air France.